Halfords is one of the longest established retailers specilising in accessories for cars, bikes, camping, baby and child and mobility aids. 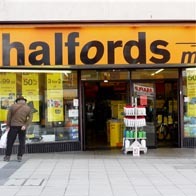 The Halfords online shop is the easiest place to check whether the items you want are in stock and also where you will find all sorts of special offers. There is also a great advice centre for all your questions about the products. Any unwanted goods can be returned within 28 days to the local Halfords store, or by post in its original packaging.